Lithium-ion batteries have made headlines for the wrong reason: as a fire hazard. Just this past May, three apparent battery fires in Tesla cars were reported in the United States and Switzerland. In the United States alone, a fire in a lithium-ion battery grounds a flight every 10 days on average, according to the Federal Aviation Administration. And the same problem afflicts electronic cigarettes, which have been blowing up in people’s faces sporadically. No other drawback has so hobbled the advance of what is by far the most promising battery technology to emerge in our lifetimes. Lithium-ion batteries store much more energy than previous chemistries could manage, making them crucial to the future success of phones, drones, cars, even airplanes. Solving this problem would not only protect lives and property, it would also make it possible to use larger battery packs with more closely packed cells. We’d finally be able to fully exploit the great energy-to-weight ratio, or specific energy, that this technology allows. What’s more, we’d be able to make progress with the next generation of batteries, the ones that use lithium metal. The problems of today’s lithium-ion batteries can be traced largely to dendrites, tiny threadlike structures that form on the surface of an electrode over repeated cycles of charging and discharging. But through our work at Dartmouth and Stanford, the two of us have found that a little chemical tweaking of the electrolyte can head off the pesky growths. 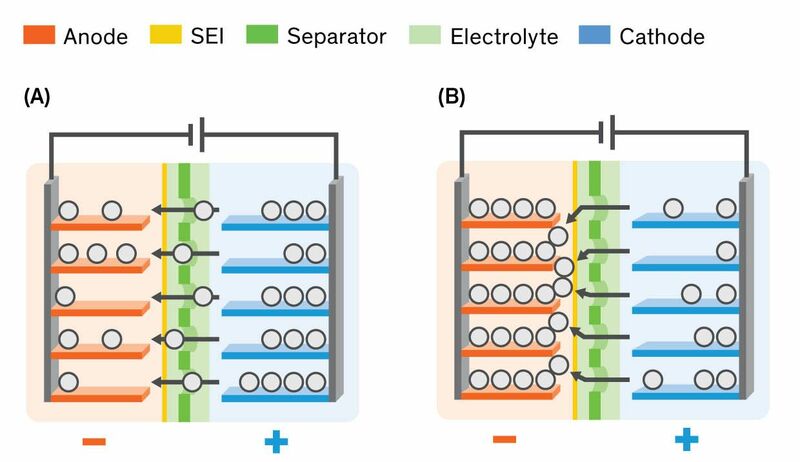 (A) Charging: Lithium ions move from the cathode [right] through the separator [middle] and on to the anode [left]. (B) Overcharging: When no more room remains for ions, any excess ions will begin to accumulate on the surface. (C) Crystallization: Accumulating ions form metallic crystals, which damage the solid electrolyte interphase (SEI), where the anode meets the electrolyte.